Palestinian citizens in Kafr Qasem village, in the 1948 occupied Palestinian territories, on Monday, 29 October, organized events commemorating the 62nd anniversary of the massacre committed by Israeli border guards against the village's residents in 1956. Kafr Qasem residents first staged a mass demonstration toward the memorial built for the martyrs who fell in the massacre then visited the martyrs' graves in the village's cemetery. Kafr Qasem mayor Adel Bdeir, speaking to the Palestinian crowd, said, "We will never forget that horrible day, and we will never forgive the murderers." Mohammed Baraka, who heads a committee in charge of the Palestinian citizens' affairs in the 1948 occupied Palestine, called for reopening the investigation into the massacre, in light of recent confessions by a high-ranking Israeli official. Issachar Shadmi, during an interview with Haaretz, before he died in September 2018, said that the massacre was aimed at spreading fear and terror among the Palestinians of the 1948 occupied Palestinian territories and forcing them to flee to Jordan. Baraka stressed that a new investigation should be opened so that Israeli criminals are held accountable for their crime, especially that Shadmi admitted that his trial was only a "show trial". On 29 October 1956, the Israeli army ordered that Kafr Qasem and other neighboring villages be placed under a wartime curfew in the afternoon. The order was given to border police units before most of the village's residents could be notified. Many of them were working in their lands. As the villagers were returning to their homes, unaware of the new Israeli measures, the Israeli border guards without hesitation opened fire at them killing 49, including men, women, elderly people, and children. Following the massacre, a military cordon was maintained around the village for months, and a total ban on media coverage of the massacre was imposed. Nonetheless, news of the incident leaked out after left-wing activist Latif Dori collected testimonies from the injured held at Beilinson Hospital, and after Knesset members Tawfik Toubi and Meir Vilner managed to enter the village two weeks later and investigate the rumors. The Israeli government at that time, led by David Ben-Gurion, tried to cover up the massacre and held show trials for a number of Israeli border guards and soldiers involved in the crime, and they were sentenced to different prison terms ranging between 7-15 years. However, none of the officers served out the terms of their sentences; Israel's Court of Appeal reduced most of the sentences and some soldiers were pardoned by the president. 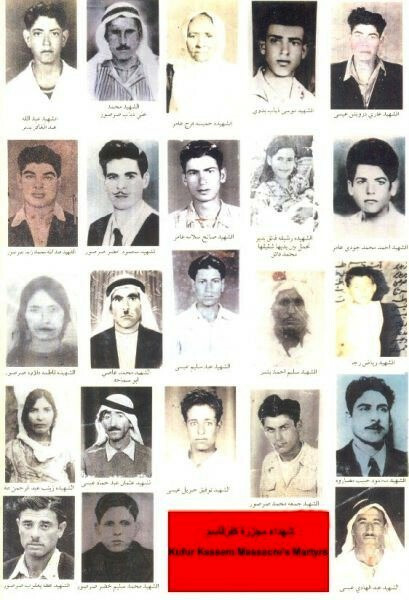 By 1960, less than four years after Kafr Qasem massacre, all those involved in the crime had been released. 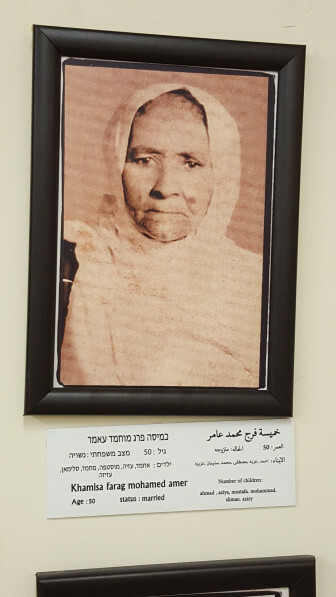 Relatives of some of the approximately 50 men, women and children killed by Israeli Border Police in 1956 in the Arab village of Kafr Qasem appeared Sunday (15/7/2018) in Tel Aviv Military Court for the closing hearing in a case filed to force the disclosure of secret documents regarding the Kafr Qasem massacre. “I want to know why my father was murdered and what he did,” Mohammad Freij told Haaretz. Freij who lives in Kafr Qasem, was three years old when his father was killed. 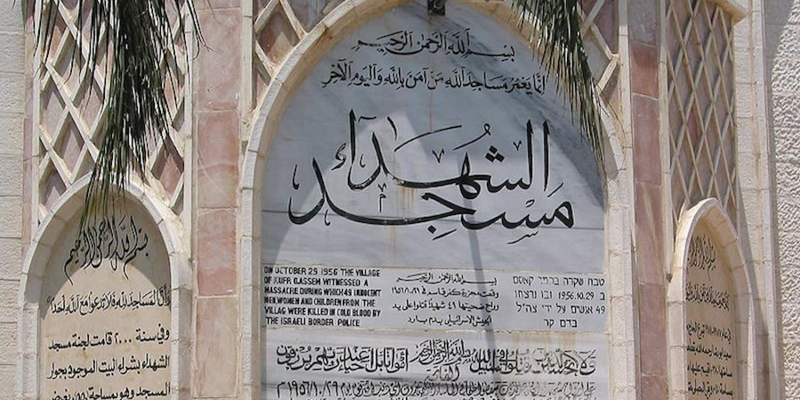 The Kafr Qasem massacre took place in the Arab village of Kafr Qasem situated on the Green Line, on October 29, 1956. It was carried out by the Israel Border Police (Magav), who killed Palestinian civilians returning from work during a curfew, imposed earlier in the day, on the eve of the Sinai war, of which they were unaware. The border policemen who were involved in the shooting were brought to trial and found guilty and sentenced to prison terms, but all received pardons and were released in a year. The Israeli court found that the command to kill civilians was “blatantly illegal”. Over the past year and a half, the president of the military court of appeals, Maj. Gen Doron Piles, has been presiding over the unusual case, at the heart of which is a request from historian Adam Raz to gain access to the case. Raz directed his request to the military appeals court after the army archives refused to make public the documents. Raz said he had made a preliminary examination of the historical documents, and found out that the most important material was kept secret. Raz and the Palestinian locals hinted at a preplanned political scheme to forcibly deport the residents of the Triangle area in northern Palestine to Jordan, saying the scheme lies at the heart of the massacre. Secret documents were shelved following behind-closed-doors hearings. The court claimed that lifting the gag order on the document will harm the security of the state, its foreign relations, and in certain cases, personal safety. Disclosure of the classified documents was officially prohibited. A series of events kicked off on Sunday morning to mark the 61st anniversary of the Kafr Qasim massacre committed by the Israeli occupation forces against the Palestinians. A general strike and a mass rally were held in Kafr Qasim to mark the event. Dozens of Palestinians joined a march that kicked off from Abu Bakr Mosque. Municipal delegates, civil society representatives, activists from 1948 Occupied Palestine, and MKs from the joint Arab List were in attendance. The rally-goers chanted slogans condemning the Israeli crimes against the Palestinians and vowing to keep up the anti-occupation struggle. The marchers also called on the Israeli occupation to extend an official apology over the massacre. 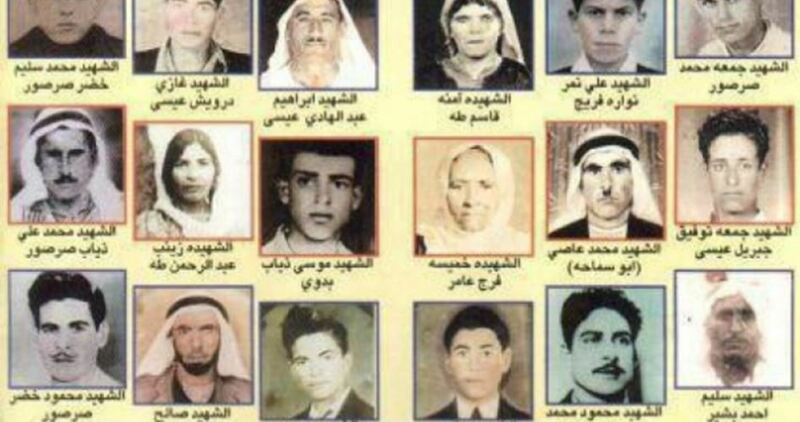 The Kafr Qasim massacre was perpetrated by the Israeli occupation forces on October 29, 1956 in territories occupied in 1948, claiming the lives of at least 49 Palestinians, among them women and children. The story begins with the quiet life in the village before the massacre and ends with the Israeli government’s attempt to cover up the crime. The 29th of October 1956 started as a quiet day in the village of Kafr Qasim, then under military rule since it was transferred to Israeli occupation by the Jordanian king in 1949. The villagers, hard-working peasants and workers, went out early to work in the fields and in near-by stone quarries. In the afternoon a unit of the Israeli army came in and informed the village head that they are coming to impose a curfew. They told him to warn the villagers not to get out of their homes. “But what about the people that will come from work, I can’t warn them of the curfew?” he asked. “Don’t worry, I will let them in” answered the soldiers. Eventually, as farmers came back from their fields and workers from the workshops, the soldiers gathered them in small groups on the entrance to the village. Then the officer ordered to “mow them down” and they were shot dead, their bodies piled in heaps at the side of the road. Fourty-nine people were killed in cold blood without any provocation, for violating a curfew order that they was not aware of. 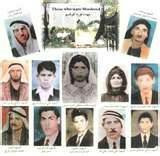 Twelve of the martyrs were women and girls, 17 children, the youngest of them only 7 years old. 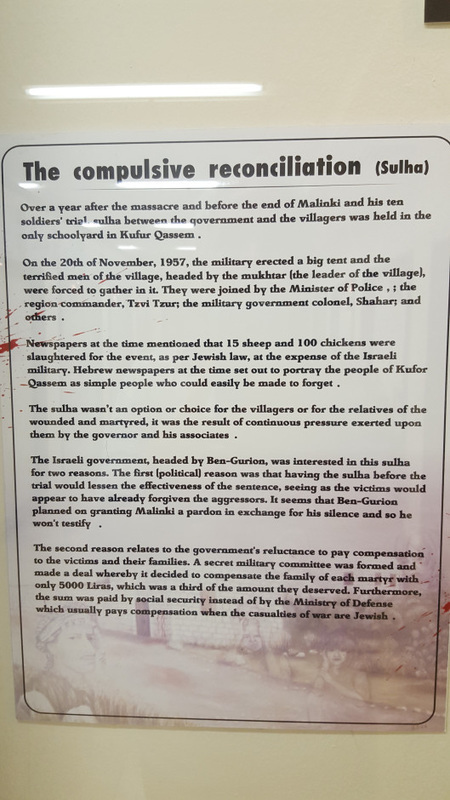 The massacre of Kafr Qasim was not an isolated incident. It was intentionally planned by elements in the Israeli army command as part of a much bigger plan to complete the ethnic cleansing of 1948. 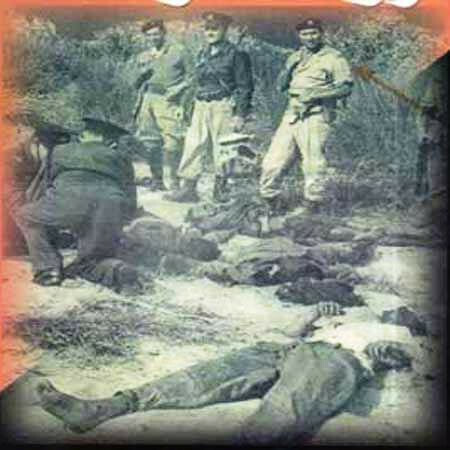 The massacre was carried in the first day of October 1956 Tripartite Aggression of Britain, France and Israel against Egypt. Israel hoped that, under the cover of the fog of war, new massacres would cause the Arab Palestinian population to seek refuge and safety beyond the Jordanian border. 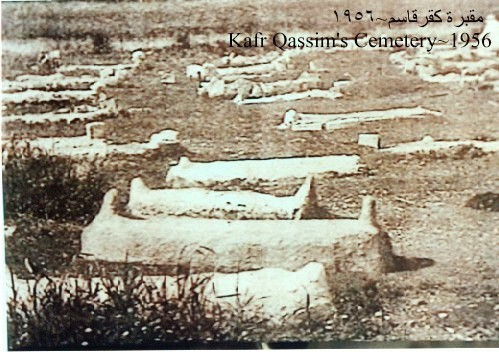 The people of Kafr Qasim were not even allowed to bury their dead. The army kidnapped at gun-point some men from the nearby village of Jaljulia and forced them to bury the massacre’s victims in Kafr Qasim’s cemetery, while the curfew over the village was extended to three whole days. Israeli military censorship prevented any mention of the crime in the press. It required a prolonged struggle, mostly led by the Communist Party, just to publish the shocking facts about what the army did. In the coming years the military government continued to terrorize the population and prevent the commemoration of the massacre. As we visited Kafr Qasim today, our hosts told us how the army used to force a siege of the village on the anniversary of the massacre. The army was even searching homes and confiscating any piece of black cloth in order to prevent any sign of mourning. Only in 1966, at the 10th anniversary, as the military rule in the 1948 and 49 occupied territories was abolished, could the people of Kafr Qasim for the first time openly and more or less freely commemorate their martyrs, with solidarity delegations coming from all over the country. I must confess that this year was the first time that I attended the Kafr Qasim massacre commemoration. The local tradition is to start the commemoration march at 8:30 in the morning, an unconventional timing for a public event and a real challenge if you come from far away. As we entered Kafr Qasim this morning it was suspiciously quiet and we almost thought that the event would not really start so early. But when we approached the designated gathering place at 8:40, thousands of people were already marching and we quickly joined them. We marched to the location of the massacre, at what was once the western entrance of the village but is now at the center of what has become a poverty stricken town. There, near the massacre memorial, a mass meeting was held. I was mostly impressed at the way that the whole population is now involved with the commemoration. Men and women of all ages attended, most of them wearing special black T-shirts with the symbol of the 60th anniversary. Another extraordinary feature of the date was the simultaneous translation of the whole event to sign language for the deaf. Soon we also understood why the march started so early, as the sun climbed up the sky and the heat became hard to bear. We heard Kafr Qasim’s Mayor Adel Bdeir, the representative of the grandchildren of the victims, an Islamic Sheikh and Muhammad Barake, the head of the “follow up committee” that represents the whole Palestinian Arab population in the 48 territories. At the end a group of children released 49 green and black helium balloons into the air. Then there was another march, following the last journey of the martyrs, from the location of the massacre to the cemetery in the East of the village, just near where the Jordanian border used to be. When we went back many people were still coming in all along the main street of the town. The morning events were just one part of the wider 60th anniversary commemoration. Over the last month there were educational programs about the massacre that involved every pupil in Kafr Qasim’s schools. There were more marches before today and another central mass meeting was set for tonight, with more speakers from out of the town. It was said that in the next anniversaries the commemoration should not be restricted to Kafr Qasim itself. They told us about their grandmother, Khamisa Amer, who was with a group of women that went out to pick olives in that fatal day. As they came back in the pickup car, the army stopped them. First they took out the three men that were in the car and shot them. Then they shot at the group of women inside the car. When we met Roz and Rim they were interviewing Hana’a Amer, who was 14 years old at the time of the massacre and came to help with the olive harvest under the supervision of their grandmother. Hana’a was shot and wounded in her leg and head, her skull was broken, but she stayed alive lying in the pile of corpses. She didn’t understand what was going on, not grasping that all the other women around her were dead. It was her rare luck that the soldiers didn’t notice that she was not dead like the others. Much later, when the murderers went and other soldiers came to carry the dead, one soldier tried to carry what he thought was Hana’a’s dead body by dragging her from her hand. She cried with pain and eventually was taken to the hospital. I think it was the first time, only after 60 years, that Rim and Roz heard a first-hand report about the conditions in which their grandmother was martyred. They told us about another interview with a man that was likewise wounded but survived after staying the night under a pile of corpses. He told of his pain as he heard his neighbors approaching one after the other the army checkpoint and being shot dead, and his great agony at not being able to warn them. He spoke about how the soldiers would shoot at any victim that was still not dead. The officer told them to shoot one bullet at each head, so as not to waste precious ammunition. We visited the museum for the commemoration of the massacre. 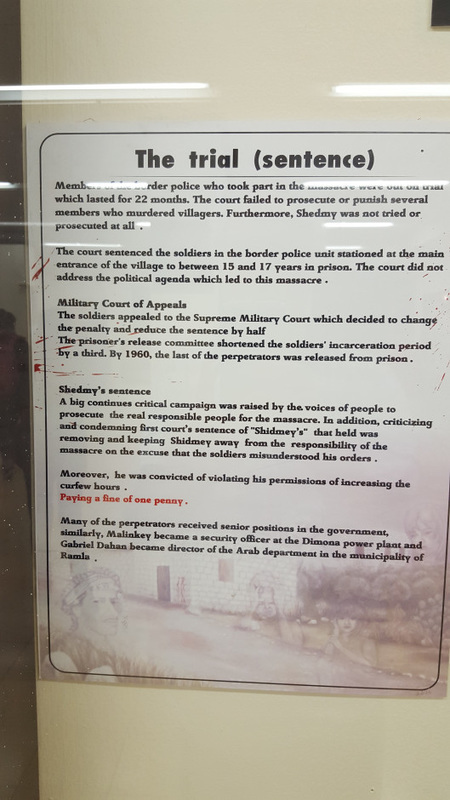 For the 60th anniversary, the people of Kafr Qasim opened a stunning new section of the museum called “panorama,” where you go through a dark cave and pass by several scenes that represents the stages of the massacre. You can hear the full story there in Arabic, Hebrew or English. It starts with the quiet village life before the massacre and ends with the government’s attempts to cover for the crime. The people of Kafr Qasim see a special insult in the supposedly “traditional reconciliation treaty” (Sulha in Arabic) that was organized after the massacre. They say it was designed to wash the hands of those responsible to the massacre and was forced on the villagers by the coercion of the military government. Another insult is the trial of the officers and soldiers that initiated and perpetrated the massacre. The highest officer that was sentenced, Colonel Shadmi, was fined a symbolic one cent! Eight lower ranking officers and soldiers were sentenced to prison terms but pardoned after a short period. The responsible officers were all promoted to more important jobs. In today’s commemoration all speakers drew a straight line from the refusal of the Israeli government to take responsibility for the crime to the continued policy of discrimination against the Arab population today, including the continuing confiscation of Kafr Qasim’s land, the inability to get building licenses and the systematic house demolition. But not only is discrimination continuing. 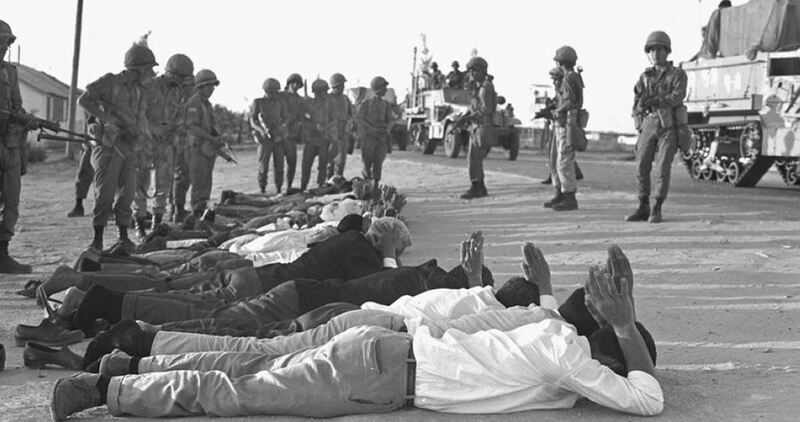 The massacre itself continues with the intentional killing of Arab citizens of Israel participating in protest actions on Land Day (1976) and October 2000, as well as the killing of dozens of others over the years for all or no reason with impunity. And, of course, Israel’s continuing massacre of Arab Palestinians continues on a much wider scale in the occupied West Bank and in Gaza under the deadly siege. It is all part of the same struggle for liberty from the same murderous racist regime. The Palestinians of occupied territories in 1948 and the people of Kafar Kassem city could not forget the massacre where they remained steadfast despite the Israeli attempts to expel them. Fifty-six years have passed since the heinous massacre committed by the Israeli occupation forces against the people of Kafr Kassem town, an Arab village located on the border of 1948- occupied Palestine with the West Bank. On October 29, 1956, the Israeli army ordered that all Arab villages near the Jordanian border be placed under a wartime curfew. The order was given to border police to 'shoot on sight' any villagers violating the curfew before most of the Arabs from the villages could be notified. Any Arab on the streets was shot despite that many of them were at work at the time. The Israeli decision resulted in 49 Arab civilians dead, including women, children and elderly people. Kafar Kassem's villagers and the Palestinians of 1948 occupied territories did not forget what Prime Minister Golda Meir said commenting on the brutal killing by Israeli occupation soldiers: "The old will die and the young will forget. However, the village's residents did not forget the massacre and they mark its anniversary each year by not going to work, marching through the village's streets holding the martyrs' pictures and reading poems commemorating the martyrs of the massacre. Legally based, the human rights organizations believe that the massacre is a war crime could not be subject to any statute of limitations, where calls are increasing for the prosecution of the occupation on the massacre as an ugly war crime carried out by the occupation forces. At that time, the Israeli court had fined those who committed the massacre for only one penny in total disdain for humanity as a whole, the fact that could not be tolerated over time. 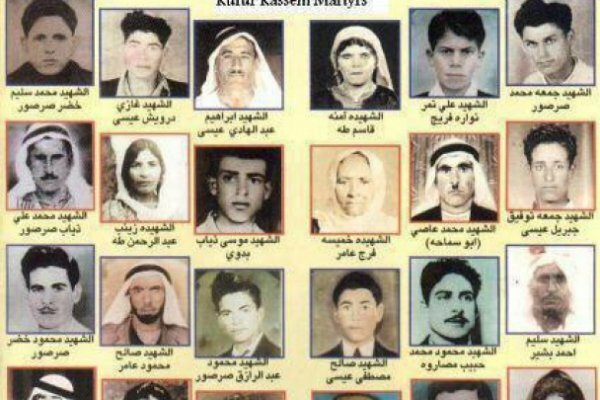 The people of the village of Kafr Kassem, along with all Palestinians of 1948 occupied territories mark each year the anniversary of the massacre of Kafr Kassem, which took place on 29 October,1956, killing 49 Palestinians, including women and children without mercy or pity.